Remember the classic 9/30 trading setup we introduced five years ago? Would you be shocked to learn that this simple strategy is all you need to start your trading journey? Sure, you will not be profitable right away. But it provides a great launchpad for a trader who is new to technical tools. When starting out, you will certainly appreciate the simplicity this trading strategy offers. What most seasoned traders know that many people don’t know is that a trading strategy is a living object. It is not meant to be static. A trading strategy isn’t finished just because it has a complete set of trading rules. In many ways, that’s just the beginning. Think of your trading setup as a piece of unshaped rock. Sure, you can hit your prey with it when you hunt. But you can also fashion an arrowhead from it and attach it to a stick. Then, you have a spear, a more potent weapon with greater range. This is why top traders never stop improving their trading methods. They try to improve their trading with different tools and observe their results. Fortunately, this process isn’t rocket science, if you start with a basic strategy like 9/30. Here, you’ll learn three ways to transform the mechanical 9/30 setup into a well-polished approach. Before that, let’s recap the rules of the 9/30 trading setup. When attempting to improve a trading setup, never forget its premise. The 9/30 setup is essentially a retracement setup. It seeks to align itself with the prevailing market trend. With this premise in mind, it’s easy to think of the trend line bounce. 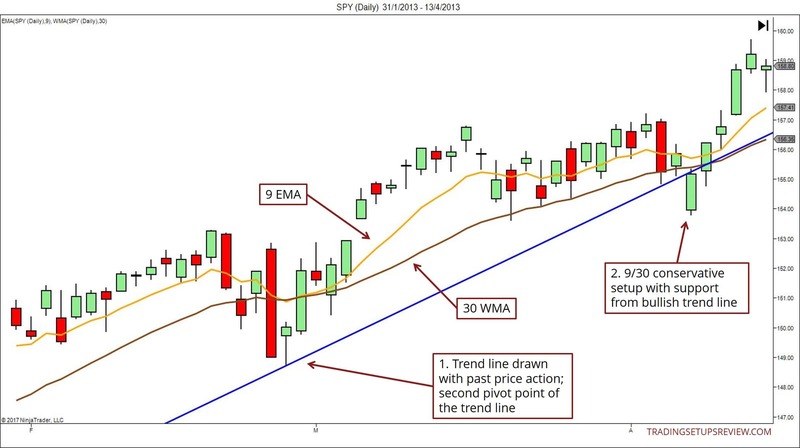 While a trend line relies on price action structure, the 9/30 setup uses a pair of indicators. We have two different tools looking for similar price action behaviour. That’s synergy. Let’s see take a look at an example. This bullish trend line was drawn based on past price action. (The trend line drawing technique is taught in my trading course.) 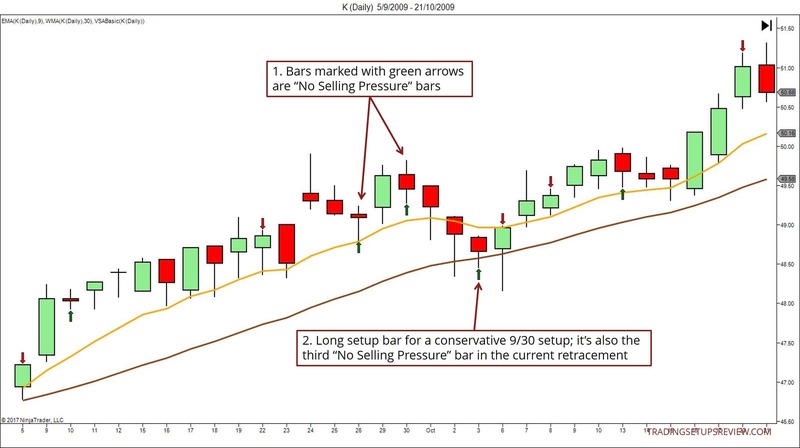 This conservative 9/30 setup (whole bar below the 9 EMA) bounced off the bullish trend line – a great long setup. This conservative 9/30 setup (entire bar below the 9 EMA) bounced off the bullish trend line – a great long setup. The setup bar in this example was not only below the 9 EMA. It was also entirely below the 30 WMA. Hence, the bearish momentum was evident and might have deterred some traders. However, there was a solid redeeming factor. The setup bar finished as a strong bullish trend bar despite the bearish opening gap. That was a strong bullish signal, not to mention the trend line support. Congestion areas are excellent support and resistance areas. They offer great value for any trader looking to improve their trading odds. 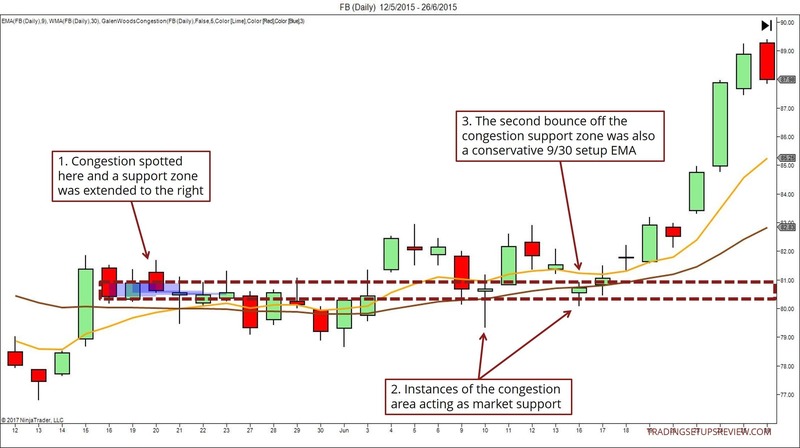 In the example below, let’s look at how a congestion area can help you to find a higher quality 9/30 setup. We’ve identified a congestion area here. There are many ways to define congested price action. In this case, for consistency, we used the definition in my trading course. The congestion area implied a support zone. These two bounces showed that the market responded to that support area. The second bounce off the support zone was also a conservative long 9/30 setup. When trading the 9/30 setup, don’t forget to pay attention to the moving averages. Observe how the 9 EMA stayed above the 30 WMA despite the seemingly sideways price action. Here, the dual moving averages helped to clarify the raw price action. In the process, they also assured us of bullish undercurrents. Be careful when analysing volume. If you are not confident of your price analysis, adding volume to your arsenal will only confuse you. But if you are skilled in reading volume signals alongside price movements, you have a great deal to gain. There are many methods to use volume in market analysis. Here, you will see one of the most popular methods in action – the volume spread analysis (VSA). If you are not sure, please read this VSA guide before moving on to the example below. These are “No Selling Pressure” bars as discussed in this guide. Through reduced spread and volume, they signalled that the market had no interest in selling off. This was the setup bar for a long 9/30 conservative setup. It’s also the third “No Selling Pressure” bar in the retracement downwards. It’s clear that volume adds valuable depth to analysing a standard 9/30 trading setup. But make sure you know how to make use of the extra volume data. Now, How Does Your 9/30 Strategy Look Like? Trend lines, congestion zones, and volume analysis are extremely useful tools. They add a layer of discretion on top of a simple strategy like the 9/30. These tools are not complicated. In fact, you could consider applying them to a variety of setups beyond just the 9/30. Applying smart filters to a classic trading strategy is what separates the profitable traders from the masses. Look at it this way: You’ve acquired a solid starting point with classic setups from experienced traders. So why not try your best to improve it and make it your own? Go on and explore your charts with these trading tools. Have fun! Glad to hear that! You might also like the Floor Trader System. Glad to hear that! All the best to you!